Today is my birthday! Our family tradition is that the birthday girl/boy gets to choose their dinner and cake. Let me just tell you...I'm not good with choices. I pondered for weeks over which chocolate cake recipe to make. As for the filling; that was another laboring decision. 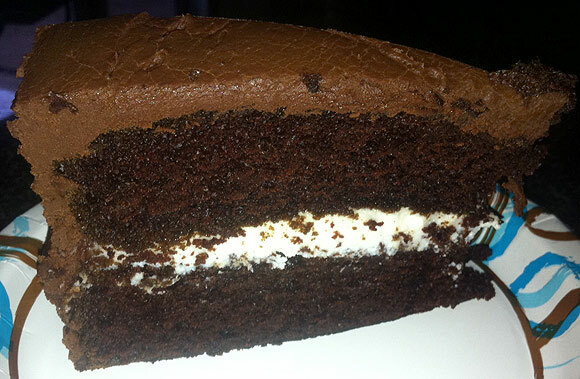 I finally decided to do a chocolate almond cake with a ricotta cheese filling and chocolate butter cream frosting. So when it came to dinner I thought I'd just let my husband pick that one. We have very similar tastes in food so I didn't think it was a big deal. Then he told me we were going to have meatloaf. Don't get me wrong...I love meatloaf; but for my birthday dinner....really??? Well this might be my go to birthday dinner for years to come. The meatloaf was just that good. I know it sounds weird for me to be describing a meatloaf like this. But this was no ordinary dry, lifeless lump of meat. It was moist a moist gooey mixture of two different kinds of meat and 3 different cheeses. All topped with tomato sauce. I would suggest giving this recipe a try; even if you normally don't eat meatloaf. I'm not sure how anyone could not like this one. 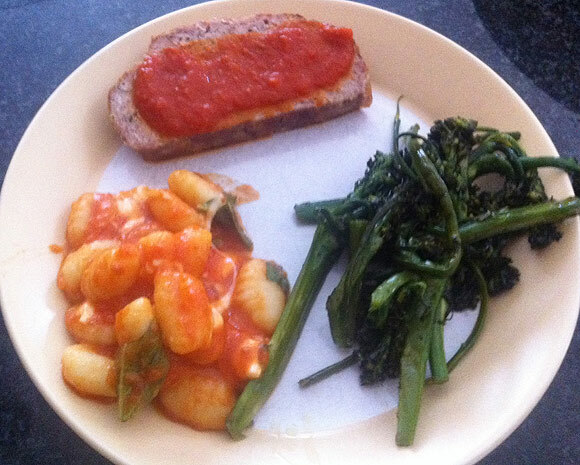 We served the meatloaf with sauteed broccolini and gnocchi with melted mozzarella and tomato sauce. Preheat oven to 375 degrees. Pour the milk over the bread cubes in a bowl, and let soak for a few minutes, until the bread is saturated. Squeeze the soft bread a handful at a time, pressing out as much milk as you can (discard milk), then tear bread into small shreds and toss back into the bowl. Crumble the ground beef into the bowl, and add the eggs, ricotta, grated cheese, parsley, nutmeg, salt, and pepper. Fold and toss everything together, and squeeze the mixture a few times between your fingers to distribute all the ingredients evenly. Scatter the mozzarella cubes on top, and fold and mush them throughout the loaf mix. Brush a roasting pan with 2 tablespoons of olive oil. Gather the meat mixture in the bowl, turn it into the pan, and shape it into a fat oval loaf. Drizzle with the remaining 2 tablespoons olive oil. Cover the pan with foil and bake 45 minutes. Remove the foil, and continue to bake until the meatloaf is browned all over and completely cooked through, another 1 hour and 30 minutes or so. Remove the roast from the oven, and let it rest for about 10 minutes. Heat oven to 350°F. Grease and flour two 9-inch round baking pans. Stir together sugar, flour, cocoa, baking powder, baking soda and salt in large bowl. Add eggs, milk, oil, almond and vanilla; beat on medium speed of mixer 2 minutes. Stir in boiling water (batter will be thin). Whip together until smooth; adding more sugar is filling is too thin. Happy birthday love! Between the two of these recipes, I'd say you had a birthday fit for a queen! I will definitely be making that ricotta filling..yum. You had me at chocolate almond layer cake! 2 of my favorite flavors in one cake? I'm there! Happy Birthday! Happy Birthday! I'm so glad you enjoyed the meatloaf. I have never been a huge fan, but I should try this one. Perhaps it will change my mind. Happy Birthday!!! Great birthday dinner choice! Happy Birthday! I'm a meatloaf and a chocolate cake fan! Love them both! Hope you had a good one Theresa! Happy Birthday! I wish I could have joined the celebration! Thank you for sharing two delicious and decadent recipes. They are fit for a birthday queen! Love from Austin! I don't think it's strange to have meatloaf for a birthday meal. Meatloaf can be delicious - as this one obviously is. But I confess that chocolate cake really tips the scales as a great birthday dessert. Happy Belated Birthday. That's a pretty amazing looking meatloaf! I love serving it with gnocchi too. At first I thought this said "chocolate meatloaf!". I shouldn't read blogs after midnight. Oh my goodness. My birthday is in about a month and I think this is what I want to make! I haven't had luck making GF gnocchi, but I can make a pretty mean pasta and risotto.